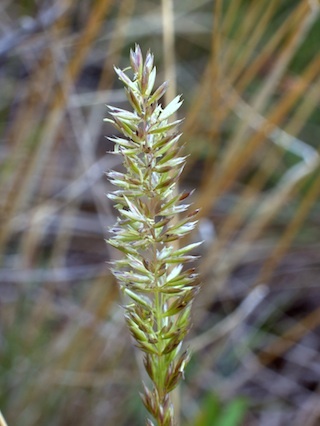 Perennial grass, 20–60 cm tall, forms dense but scattered tufts with the previous year’s leaves at the base. Stems are smooth or soft haired (often hairy near the top). Light green to grayish-blue, erect or stiff ascending leaves, 1–3 mm wide and 15 cm long, attach along the lower half of stems. Leaf blades are strongly ribbed on the upper surface, slightly pubescent to hairless, and usually folded or inrolled, but occasionally flat. Leaves have pointed tips. Leaf sheaths do not fuse around the stem and often have straight hairs, 1–1.5 mm long, at the joint of the leaf and sheath. Hairy, whitish ligules, 0.5–2 mm long, that have jagged or short-fringed tips. Shiny, pale green to tan flower clusters, 2–15 cm long, in a dense, spike-like panicle with short branches, up to 2.5 cm long. The flower cluster spreads during flowering and contracts after pollination. Flattened spikelets, 4–6 mm long, have 2–4 florets with a pair of pointed, keeled glumes and 1 or 2 pairs of similarly shaped lemmas. 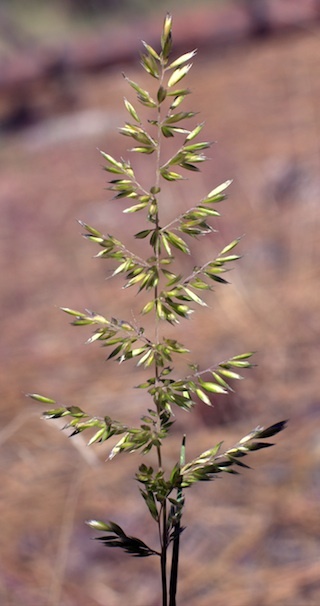 The glumes are nearly equal in size and sparse to densely short haired. The upper glume, 4–6 mm long, is somewhat broader than the lower glume and has 3–5 nerves. The slightly shorter lower glume has 1 nerve. The thin, nearly translucent lemmas are about the same length as glumes, have 5 nerves, and lack an awn or have a very short one. This species’ flower cluster can be highly varied in size and shape. Fibrous root system that occasionally has rhizomes. Tiny, brown seeds inside of straw-colored seed heads. Well-drained, sandy or rocky soils of open forests, meadows, and sagebrush communities at low to subalpine elevations. Prefers full sun to partial shade. Several species of grasshoppers and leafhoppers eat prairie junegrass; particularly those species that prefer sparsely vegetated, dry habitats. Deer (Cervidae spp. ), elk (Cervus elaphus), mountain goats (Oreamnos americanus), bighorn sheep (Ovis canadensis), and livestock graze on the early season forage. However, it does not provide a significant amount of nutrition due to its scattered growth form and short size. Prairie junegrass leaves have been tied together and used as paint brushes, brooms, or used for scouring pans. The stems have been mixed with adobe to provide tensile strength in wall building. Prairie junegrass is an ideal species for use in prairie restoration due to its ability to recolonize severely dry or disturbed areas. Once established, it can provide protective cover for other successional plant species that are less drought-tolerant. Use of prairie junegrass seed from plants growing within similar environments and the presence of soil mycorrhizae may greatly boost success of restoration with this species. No other species of Koeleria are found in our region. 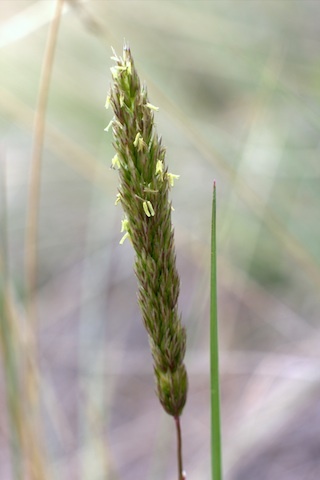 Orchard grass (Dactylis glomerata) is an introduced species that is commonly planted in orchards, pastures, and hayfields, but it is similar in appearance to praire junegrass. 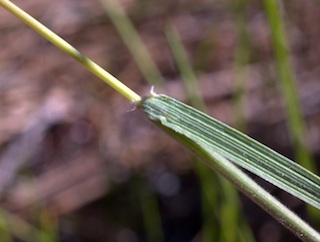 It is a clumped grass, 60–100 cm tall, with flat, bluish-green leaves and larger ligules, 3–10 mm long. Its flower clusters are dense panicles with 3–6 flowered spikelets in one-sided clusters at the tips of long branches, 1–10 cm long. It also has strongly pointed lemmas with short but prominent awns, 5–9 mm long.